Me, along with 5 other New Yorkers were invited to New Orleans, Louisiana this past weekend for the Drafts for Craftsevent at the World War II Museum. Thanks to Jet Blue for the comped airfare, it brought 6 (almost) strangers all together to experience a weekend of Louisiana food, drinks and a hell-of-a good time. Phyl: The networking guru that shakes with his right hand & holds a bottle of Hennessy in the other. Ruthie: The hilarious, commander-in-chief that keeps you punctual & in the center of all the action. Hannah: The cross-fit goddess, yet reserved individual who also shares a love of fruit-roll ups, too. Kristen: The winner of The Most Poised Award. She may just be the classiest person I’ve ever met. Sara: The sun-kissed Californian with a personality that is always down to take a shot (or 2) with you. That was the crew. We flew, explored and lived together for 72 hours. On our first night, we attended the Drafts for Crafts event. Local eateries smothered the event space with smells from the buttered shrimp & grits, slowly-roasted barbecue hog and a jambalaya that’ll make you wanna slap the Zatarain’s man himself. After the event, we hit the ground running and ended up on Bourbon Street. To be ultimately honest with you, I don’t have much recollection of that night. So, yeah..
We had about 30 minutes to spare before the swamp tour bus came and picked us up. Translation: we took lots & lots of photos. After 13 mosquito bites, snakes and wild hog sightings from the swamp, we headed to the French Quarter to feed our sweet tooth cravings. We found this super bohemian-ish food cart called The Crepe Cart. The owners totally looked like they made their own homemade all-natural soaps and baked their own gluten-free bread. I freaking loved watching them make these treats & they were awesome. After dinner at Commander’s Palace, we headed back to the room to catch up on some much needed sleep. The journey was at it’s end and we were mentally and physically at our peak. Special thank you to Ruthie for planning this trip and all of the new friends I made with this adventure. You guys are all gems. Stay shining. HealthCorps seeks a Community and Event Management Intern to work in our headquarters in lower Manhattan for 10 hours a week. They can adjust to individual’s schedule; prefer someone to start immediately and work with until the end of May, with the option to extend the internship into the summer. They are able to provide school credit and other relatable acknowledgement of internship. 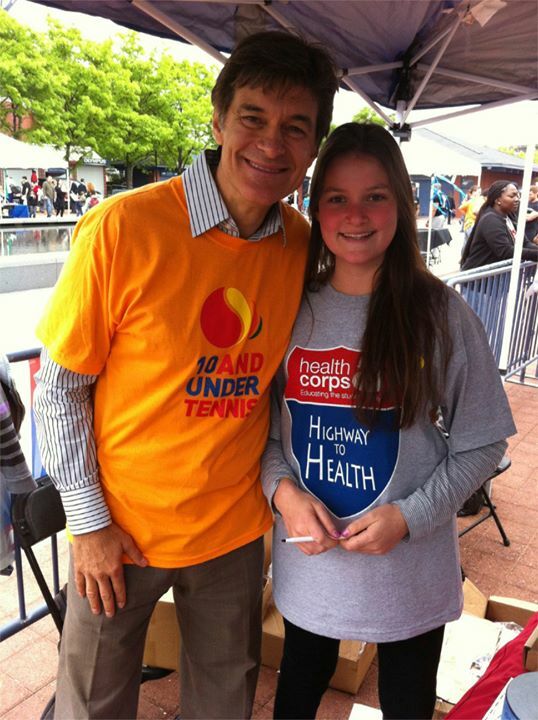 HealthCorps® is a 501 (c) 3 founded in 2003 by heart surgeon and Daytime Emmy Award-winning host Dr. Mehmet Oz and his wife Lisa to combat the childhood obesity crisis. HealthCorps is building a nationwide movement to shape a new generation. HealthCorps Coordinators lead unique in-school and community programming designed to foster physical and mental fitness, particularly among high-need populations. The Coordinators serve as peer-mentors who deliver a progressive curriculum in nutrition, exercise and mental strength to students nationwide. For more than a decade, the HealthCorps program has inspired its participants to adopt a healthier lifestyle. And the HealthCorps schools have served as Living Labs through which we can explore the complex, underlying causes of the obesity crisis, as well as discover, communicate implement and advocate for national and regional solutions. Today, the program network spans 56 schools in 11 states and the District of Columbia. Ultimately, HealthCorps’ goal is to extend the reach of its program to an ever-wider network of American communities. To that end, in 2012, we introduced HealthCorps University, a train the trainer professional development program that makes available the HealthCorps principles and curriculum to virtually any school, community or organization. For more information, please visit at www.healthcorps.org and follow us on Twitter and on Facebook. 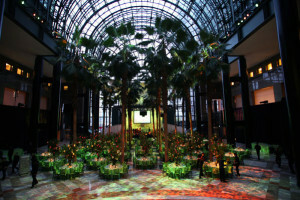 HealthCorps®’ Ninth Annual Black-Tie Fundraiser Gala hosted by co-founders Lisa & Mehmet Oz, M.D. To fund HealthCorps’® continued expansion across the United States and raise brand awareness of our fight against the childhood obesity crisis. 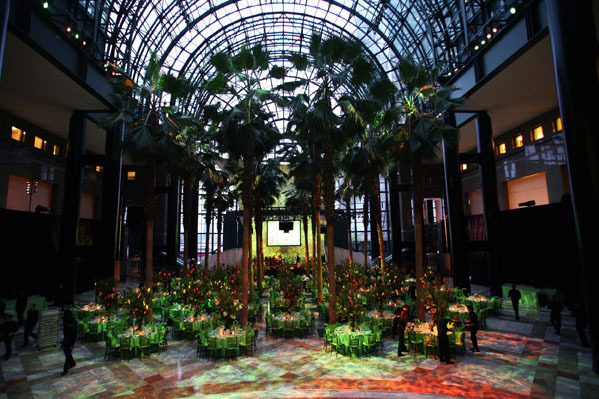 ● Past Guests include Goldie Hawn, Gloria Steinem, Quincy Jones, Hugh and Deb Jackman, Marlo Thomas, Diane Sawyer, Russell Simmons, Ben Vereen, LL Cool J, Matthew Modine, Wyclef Jean, James Blunt, Gayle King, Harold Hamm, John Mack, Donna Karan, Rocco DiSpirito, New York Governor David Paterson and NY First Lady Michelle Paige Paterson, NYC Council Speaker Christine Quinn, NYC Councilman Joel Rivera, Tara and Peter Guber, Tibor Hollo, Trey Songz, Kevin Liles, BK Boreyko, and Miss Universe. Details: entertained over 5,300 Guests and raised over $16.1 million. 501(c) 3 non-profit national service program fighting the childhood obesity crisis by building a nationwide movement to shape a new generation. HealthCorps “Coordinators” carry out unique in school and community programming targeting high-need populations. Using peer mentoring to deliver a progressive curriculum in nutrition, fitness and mental strength, HealthCorps Coordinators give teens purpose, help develop human character and inspire an interest in health and culinary arts careers. HealthCorps also serves as a unique research laboratory — exploring the complex, underlying causes of the obesity crisis and discovering and communicating solutions. We have introduced HealthCorps University, a new “train the trainer” professional development program that makes the HealthCorps principles and curriculum available to virtually any school. HealthCorps’ national peer mentoring program spans 56 schools in 12 states: (CA, DE, FL, MA, MD, MS, NJ, NY, OK, OH, OR, TX) and the District of Columbia. 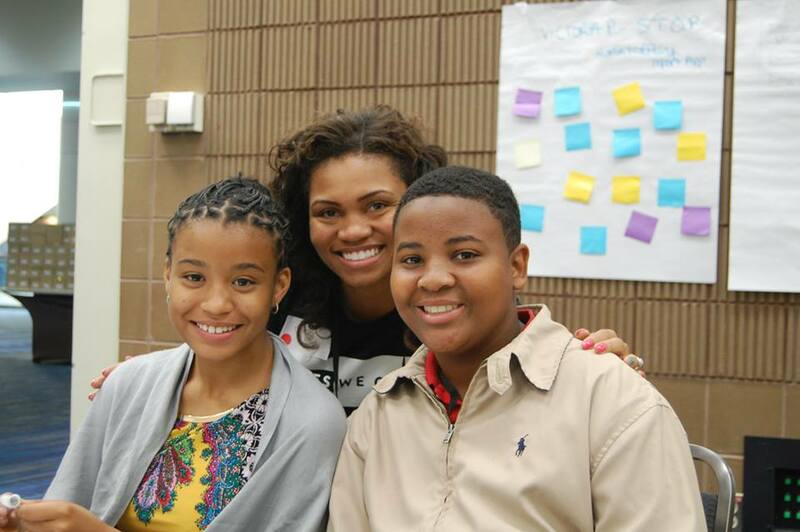 We have impacted 142,900 students and 285,800 friends and family through our work. HealthCorps (TAX ID# 26-1269358) is a non-profit founded by Dr. Mehmet Oz and his wife, Lisa, which implements an innovative in-school model inspiring teens to make healthier choices for themselves and their families. This 2014-2015 academic year, there are HealthCorps programs in 60 schools in 13 states and the District of Columbia. We have impacted 233,100 students and 446,200 friends and families through our work. The Academy for Conservation and the Environment partners with HealthCorps to host an annual in-school health fair. 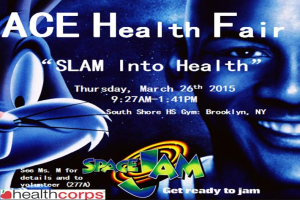 The 2015 health fair will be held on Thursday, March 26th from 9:00am – 1:15pm at South Shore High School in Brooklyn, NY. 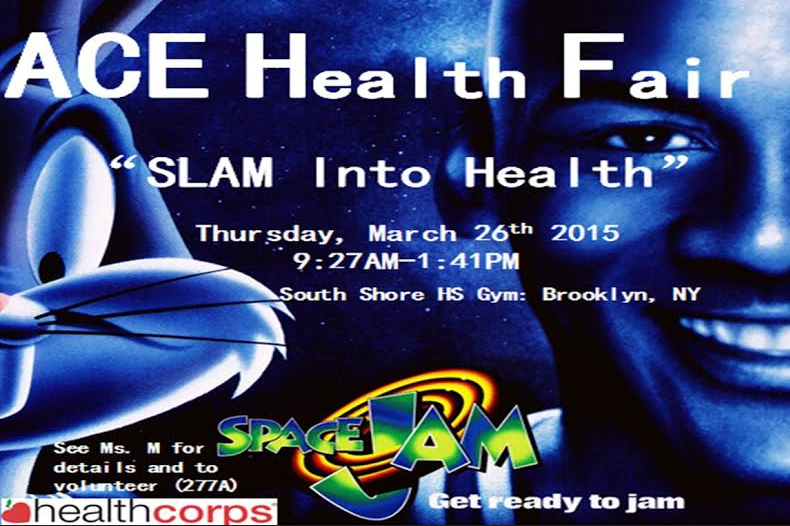 This year’s theme is “Slam into Health!” And they’re looking forward to a day of healthful and educational fun. This event aims to educate and empower high school students about their health. They would like to invite you to participate by making a product or service donation to make this event a success. This is a wonderful opportunity for your organization to market products and services that encourage the community to access care and adopt healthier behaviors. They are expecting 500+ attendees including students and staff as well as community members from the Brooklyn area. Energy floated in between everyone as we drank fast, sang loudly and laughed inevitably. Back in Jawga (Georgia), Sunday lunch was whatever my mom whipped up from scratch before the 9am church service. With 12 mouths to feed (not including the dogs), food was plentiful and afternoon naps were non-negotiable. I soon realized those cherish-able Sunday’s were now in existent for me once I crossed the Mason Dixie Line headed into the Empire State. My new buddy Phyl invited me to one of his monthly museum brunch tours at the Met Museum. Ordinarily, I invest my Sundays blissfully binge watching something politically suspenseful on Netflix. Needless to say, I needed to get out of the house.. So, my camera & I hopped in an Uber and headed to 86th street, where I will notably say I was not the last person to arrive. (I got lost, twice). Incidentally, my friends Mike and Tierra were there, too – my two favorite distractions. You’ve seen one museum you’ve seen them all. Walk. Point. Read. Put index finger on chin, pretend to analyze. Repeat. And in our case, pose (for the camera). The tour was fantastic, thanks to Jenna and her extensive art history knowledge. After an hour or two of walking, we were treated with a real New York view on the roof. Up there I caught Tierra gazing into the future. The every day artist’s future. Our future. 3 black SUV’s were arranged to drop our group of 20 in front of Sojourn, a brunch spot on 79th street. Phyl reserved a section in the back corner for us where candles were already lit and the mimosas were promptly being poured. I had the chicken and waffles, Because I’m low-key ratchet and needed to fill a hometown void my stomach was latching for. Ratchet: adj; Term coined by Atlanta natives to describe something that represents true urban stereotypes. (ie) Chicken & Waffles and just about anything Tyler Perry directs. Speaking of ratchet, the owner even let us play our own music. (Seeing that 65% of the group was from Atlanta, I don’t think he knew what he got himself into). Energy floated in between everyone as we drank fast, sang loudly and laughed inevitably. We knew we had the restaurant’s attention when our waiter began to sing the 90’s childhood theme songs with us, too. Hello, New York. I like you. Being FIT is more than just a workout every now and then or deciding to eat less carbs; being FIT is about a LIFESTYLE. Over the last year or so I have really challenged myself to live a healthier life. I guess its something that you think about more often as you get older however, its something that everyone should keep in mind no matter how old or young they are. As hectic as my weeks may be I am sure to always take time out for myself to go to the gym and it is something that I have grown to love and look forward to. There is a change I want to see (and feel) so I figured in order to stay motivated and keep it fun, I would find other young professionals within NYC who have like goals. 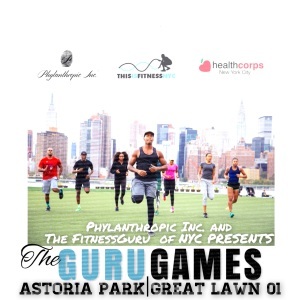 The man responsible for bringing us all together is none other than NYC Celebrity Fitness Trainer;Corey Rouse or as majority know him as, [The Fitness Guru of NYC]. 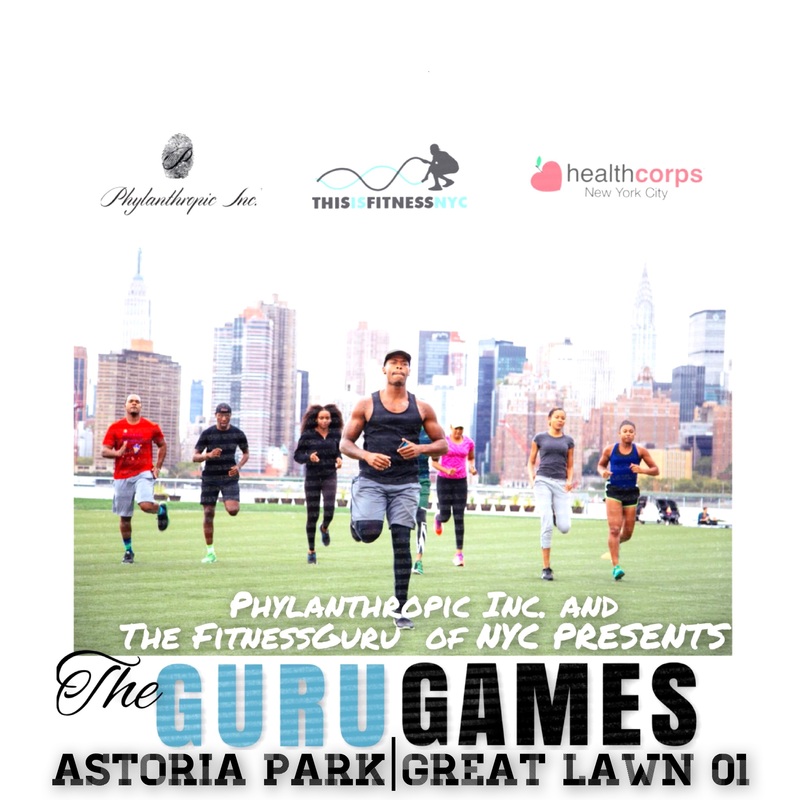 October 4th, Phylanthropic Inc. and The Fitness Guru of NYC present #TheGuruGames, a team-based obstacle course fitness competition focused on health and fitness located at Astoria Park Great Lawn 01 from noon til 4PM. While some applications were teen-centric, focusing on issues like bullying and writing college essays, many spoke to problems that face the community at large. A group of boys built a glucose-reader. A girl from Memphis built an application that would create food-to-table partnerships in areas that are considered food deserts. On Sunday, after working for four days to bring their ideas to life, the teams pitched their apps to a panel of judges that included executives from Microsoft and Facebook. The most fulfilling aspect of the weekend, says #YESWECODE mentor and creative technologist Errol King, was how much the kids were able to grasp in the short amount of time. “When you start to see light bulbs go off, when they start using the terminology we use every day in the field, you start to realize the universe has expanded,” King said. A Phylanthropist embodies leadership, giving back to the community, and positively changing people’s lives. While being a key community influencer, this role helps fuel your self-worth. Often people think of wealthy individuals when they reflect on a philanthropist, but anyone can give back regardless of income bracket. You can get involved with charity by giving time or donations. Discover below how you too can become a Phylanthropist. 1. Research various charities to determine which organizations you want to become involved in. There are numerous local, national and global charities, and connect with whichever organizations you see fit. 2. Find out ways you can become involved with each charity you have chosen. Larger organizations may have local chapters you can visit and volunteer your time. 3. Figure out how much you can give. Always remember, this can be money or time. If you are unsure how much you can spare, start out small. When giving money, you can donate as small as one percent of your total income, and eventually work your way up the donation ladder. 4. Prioritize and pledge your donation amount. Think about what you spend in a week and notice where things than can be eliminated. A helpful tip on starting donation money is to save coin change. Coins saved over a period of time accumulate into a few dollars, and this is helpful in making donations to your selected charity. 5. Become active with your chosen charity or charities. Ways to become active include fundraisers, tutoring students, coaching youth leagues, and much more. 6. Start giving today and watch how your life changes the more you become involved. Often the more you give of yourself and your money; the more great things will come into your life. This opens you up to become increasingly active as a Phylanthropist whether with your time, your money or both.